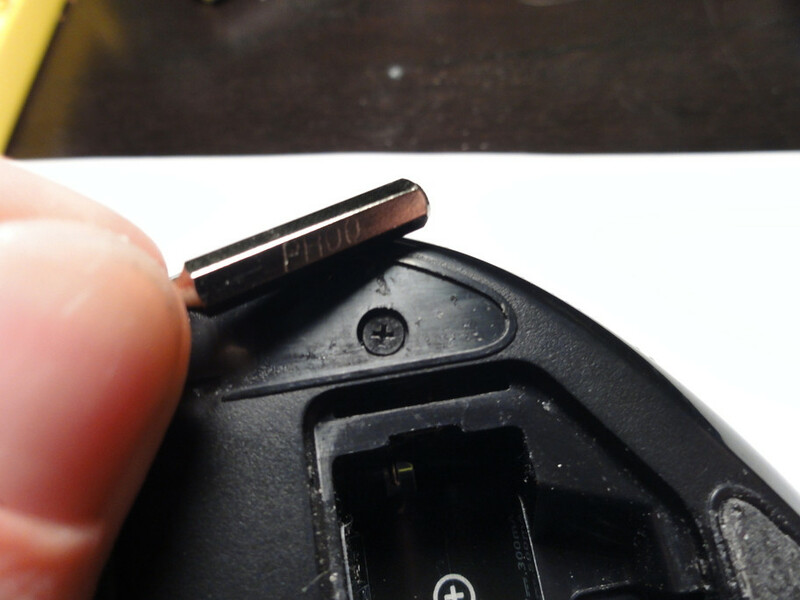 Logitech G700 Middle mouse button repair. Time to apply some hacker/maker knowledge to this – and attempt a fix of something back to its original glory, or possibly, even better than before. Warning ahead – image intensive post. I love my mouse – ask anyone who’s known me to use a computer for any period of time, and they’ll corroborate my story. 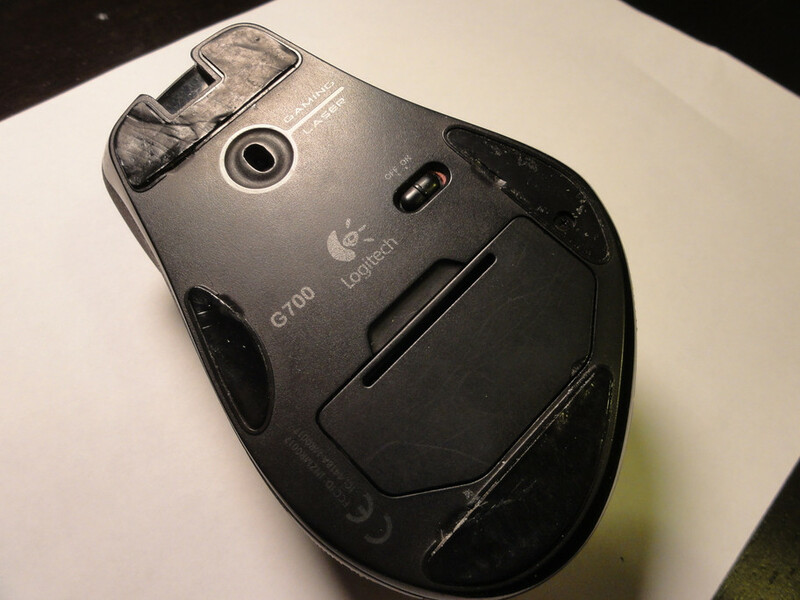 I purchased this Logitech G700 several years ago, and it has served me well through gaming, CAD work, and all of the general surfing of the interwebs. I take it along with my laptop wherever I go, including international air travel. So, you might say I was a bit distraught when the middle mouse button started acting up. First, by multi-clicking every time I used it, and then finally almost refusing to work at all. The mouse being well out of warranty, I searched the web for the part number for the tiny little middle mouse button, to no avail. 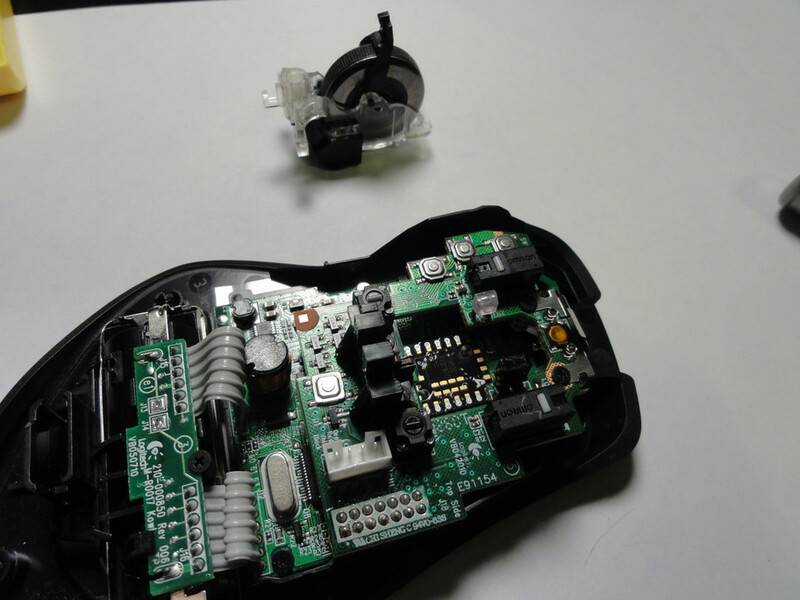 No one seems to have replaced it, or even attempted the repair of this $90 mouse. 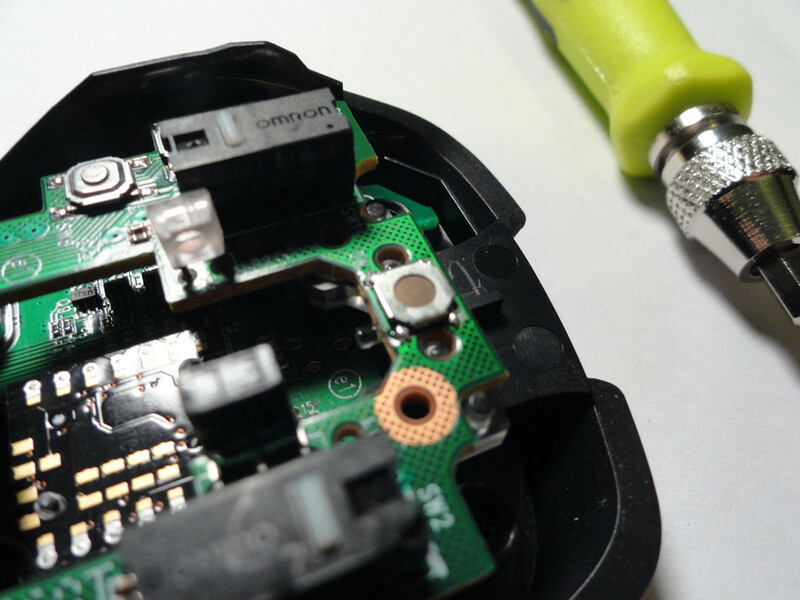 Logitech won’t release part numbers on any internal components. 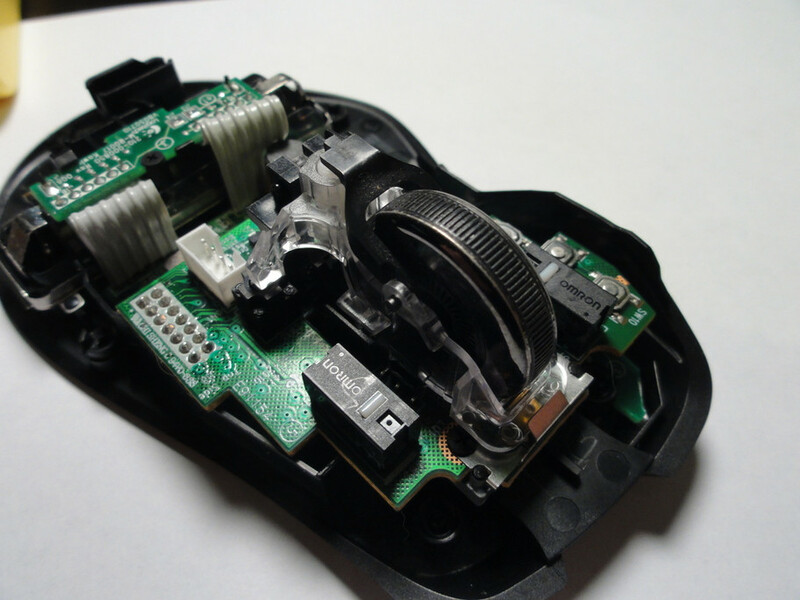 After taking apart the mouse initially, and getting some idea of what I was looking for, I took it upon myself to find it, through Mouser’s deductive search engine. Whittling it down to what it could be, I found this. Well, that’s all fine and good – but won’t this switch just fail in the same way again, in the same amount of time or less? Now that’s more like it. I wonder if it fits…. Either way, I ordered several of each because of the super low cost. This should be a <$1.00 USD Fix for anyone wanting to attempt it. Now, for the procedure. Doctor? Be careful once you have the screws out. The mouse has a cable connecting the top and bottom half. Remove it from the white connector as shown. Ah, the interior. The button we want sits right at the front under the wheel assembly. 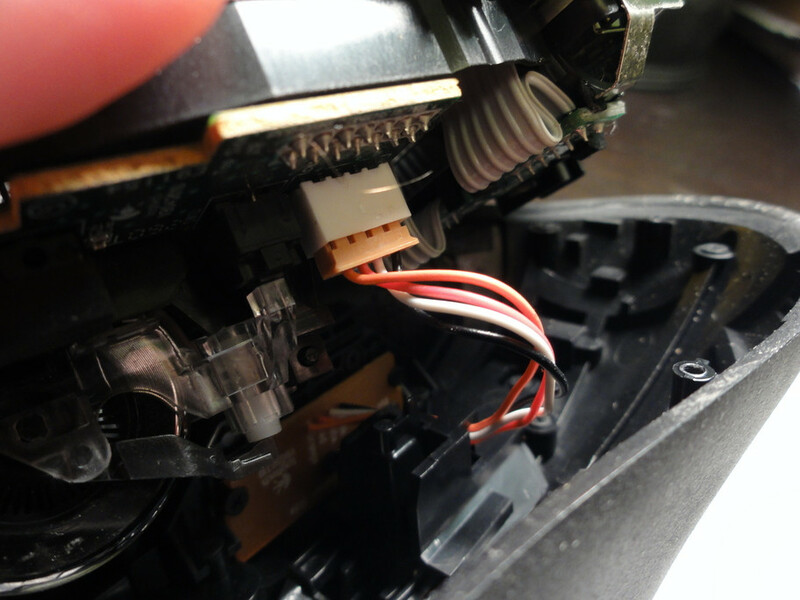 Remove the wheel assembly by pulling the black plastic pin out of its socket, located directly behind the scroll wheel. Scroll wheel just pops out of place. Lift it straight up. There’s the stock button. (small gold disc) We want to remove the little springs and metal bracket around this for easier access. Got a new ETH (1/32″) tip for my Weller WES51 Soldering station, just for this project. They have a smaller tip, but I figured I would try this one first. I de-soldered the button by lightly heating each “leg” while I pried up using a VERY small screwdriver tip. Just enough to separate the button from each of it’s pads on the board. Patience. Now, the replacement options. The Gold colored buttons are the E-Switch part, and the Grey/Black are the ALPS part. I decided to give the 160g force ALPS switches a try. they seem to be close enough in size. 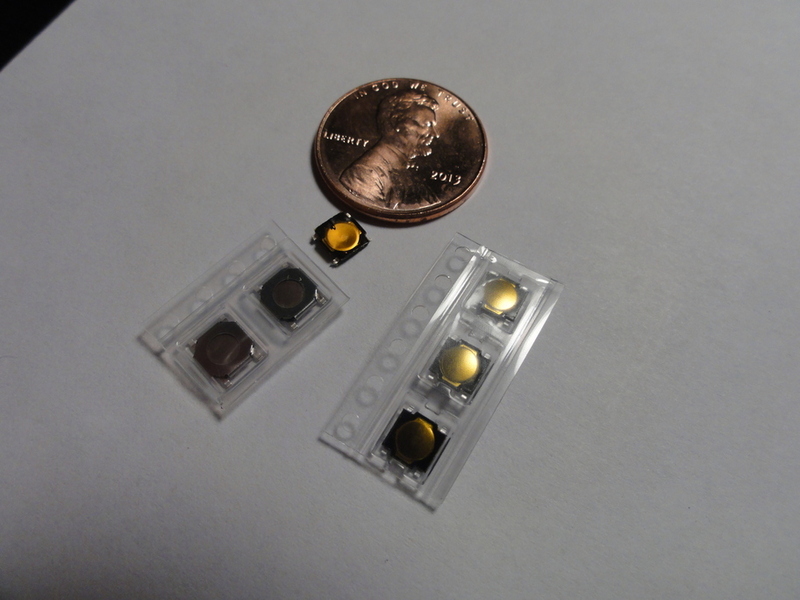 To prep the pads, I re-heated each pad to melt the solder that was there, and smooth it out. I very carefully placed the new ALPS switch in place, and heated one pad, adjusting the button with a screwdriver to get it into just the right position. This was tricky. Once you have on pad done, the others are easier. Alps Button in place! Now just to reassemble and test. Well, SUCCESS! The ALPS button works – feels like the 160g button might be a bit stiffer than stock(maybe stock was the 100g force? ), but I happen to like it. It works like a charm again. And, with a higher quality part than before. You don’t always have to hack things into other things. Sometimes, hacking is about fixing what you own, or even making it better and/or more useful for your task at hand. 01/12/2018 – EDIT: User BlackThorn has provided a link to other replacement switches in the mouse down in the comments, but i’ve listed them now here for those who wish to find them easier. I have not verified that these work, but would assume this user did. noticed you used 5.2×5.2 switches when i measured mine 4.6. did yours end up fitting fine. also would i be better off finding a switch with a stem or is it not necessary for the scroll wheel switch. i know the one you link has a twin but with a stem and it comes in at 1.5mm in height wondering if that would be too tall and cause problems with the switch being clicked in all the time. I don’t think one with a stem will fit, although you might be able to file down the stem to make it fit. There is probably a little variance in the size of the switch, as long as the electrical pads still contact, and the little plunger on the bottom of the scroll wheel bracket still line up. Thanks For The Tip, Very Nice Guide. Its Always nice seeing somebody elses work before taking something apart. 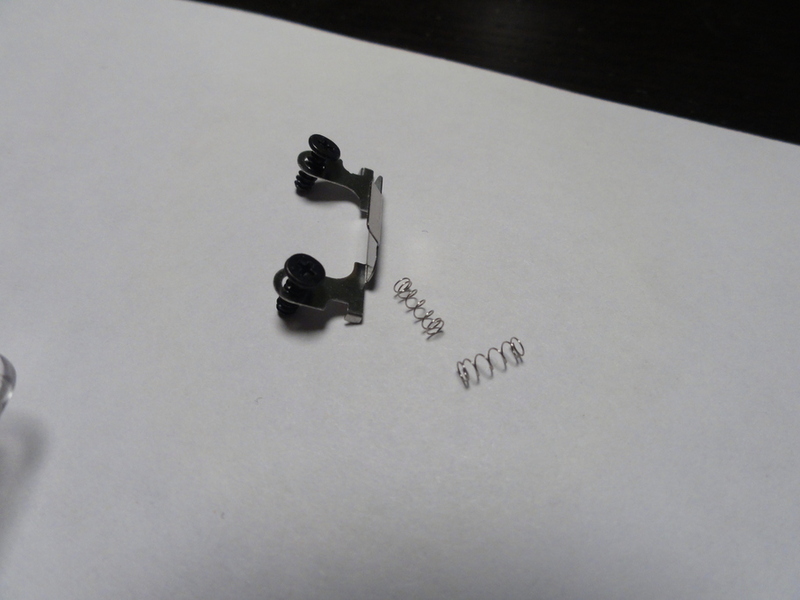 Do any of you have any idea where to get replacement for those tiny springs, or even just the excact measurements of them, managed to lose one of them when I was replacing a cord on mine and it messes up the middle click. 1 SKQGAAE010 cost about €0.40 + €20 shipped :(. where can order it @normal shipment fee>Netherlands. Thank you so much for this. I have a G500 and have the exact same issue. Luckily the internals are about the same as your mouse. Going to salvage a gold switch from a broken mouse first but again thanks for the link on the Alps part. No problem! I’m still rocking the same G700 as well, still going strong. I actually think at this point that the replacement switch has outlived the original switch. Good luck on your repair! Thank you as well for the excellent guide. I also have a g500 and am looking to refresh some of the buttons and this guide will be invaluable. I was wondering, though, if you knew what the scroll-wheel tilt buttons would be called or where they could be purchased? They appear to be some sort of tactile disc-spring but I’ve had no luck on finding replacements. Thanks so much. Unfortunately, I don’t. 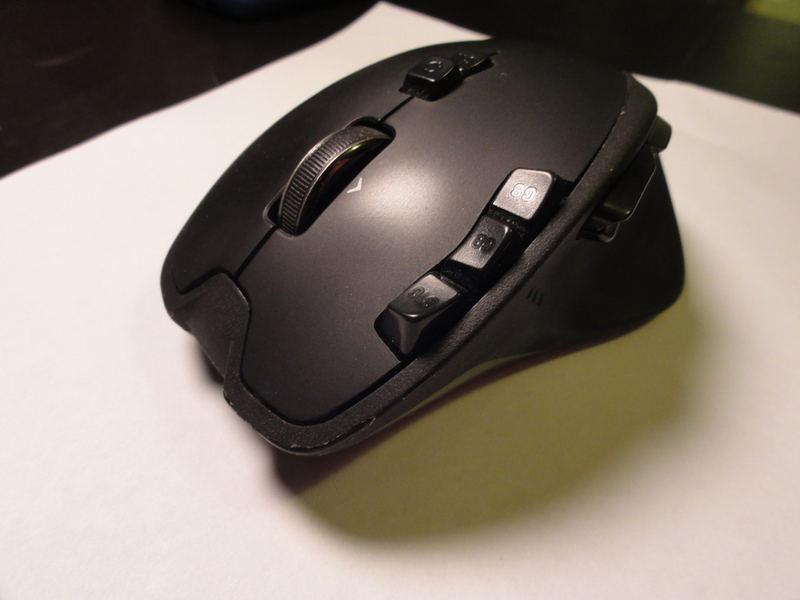 I actually have not taken the mouse apart again after I wrote this guide. 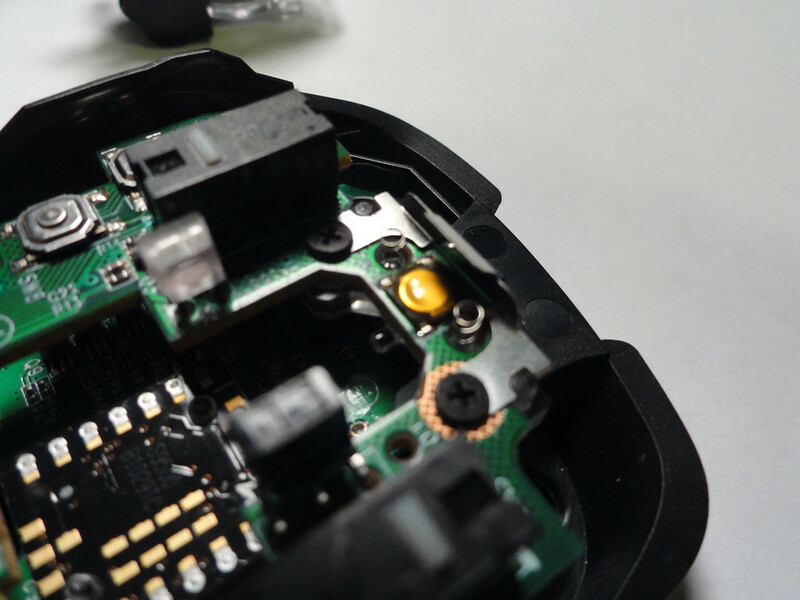 You might be able to find a replacement by narrowing down the results on Mouser or Digikey like I had done with the front click button. Thanks for listing the middle click button and the upgraded Alps button. To help everyone else out as this mouse has now been discontinued including the g700s which is identical internally other than the center of the shell which has the updated graphic. Below is a complete list of all the switches that this mouse takes along with upgraded variants. I did open my mouse to clean but I open the wheel too. Inside are to support torqued springs that I do not know how to put them back. in this case my mouse wheel is not working properly. Can you please help me with some pictures or an advice? The article and comments make it a little confusing as to what was original. Is the original switch for the middle button 1N or 1.6N? Notice the subtle difference. The SKQGAEE010 (1N) was never mentioned or linked. But again, it is not clear which N force was original on the G700. Despite this, thank you, it’s a GREAT article! I’m pretty sure the original button is 1N. Not sure though, but it was lighter force than the 1.6 that I installed. Button is still working, by the way. Hello, since this morning I’m experiencing a problem and your article seems to be the one that explains things better than any other I’ve seen so far so I wanted to ask you something, here it goes. I have a problem with my scroll wheel, when I scroll down it registers 20% of the time and when I scroll up it’s even worse with around 10% of success rate. But when I apply a little bit of pressure with my middle finger it seems to work fine. Since I bought this mouse in used condition Logitech won’t provide me any warranty support so I’m supposed to do this by myself. I would appreciate if you can help me, have a nice day. You’re very welcome! I still haven’t had to replace that button again. :) I did replace the bottom pads recently, and I have one more set of them as backup if I have to do another repair. Great tutorial. I’m trying to fix the left tilt as well. The component is soldered and I am having trouble lifting the whole board off to get at it. There is a 12 pin ‘thingy’ to the right of the cable plug that won’t come apart. Clearly soldered on the top, but looks like a regular pin thing. Any clues? I believe its just a soldered pin header. 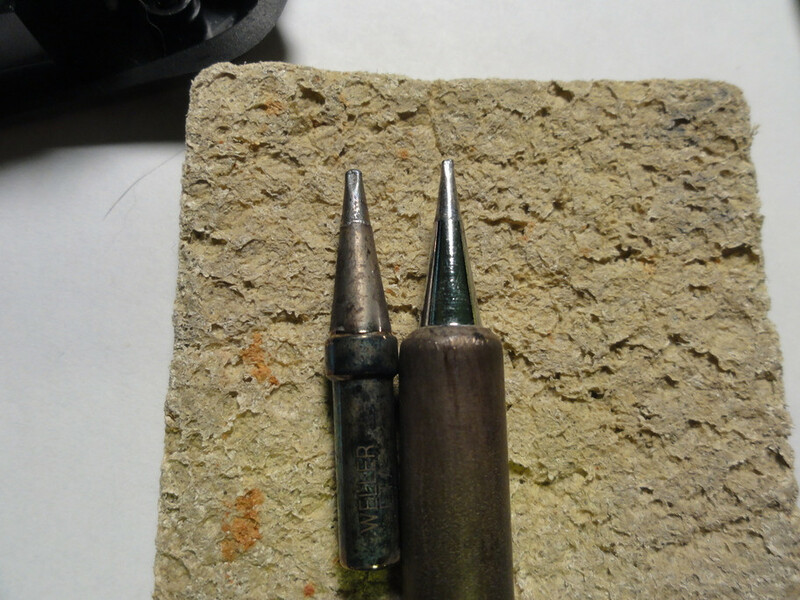 Some solder wick and a solder sucker should be able to help you remove it with patience. Good luck! You’re most welcome! My best guess is they are just trying to maximize their profits, and also grossly underestimate the number of times that button is clicked. Great info on the part numbers of the other buttons shared by BlackThorn. I had left tilt issues like some other commenters and got the Omron B3M-6009 as replacements for both left and right tilts. They are great replacement physically but the left tilt is a bit sensitive. And if you middle click often like middle clicking a website link, you’ll find yourself left tilting accidentally. I’m sure I’m not the only one who wondered why the left tilt button has a grey top and black for the right tilt. The reason is they are different switches both manufacturer and the force to actuate. The grey top left tilt is a Kailh with an ‘E’ marking. The black top right tilt has the markings ‘D3’ and ‘M’ surrounded around it. 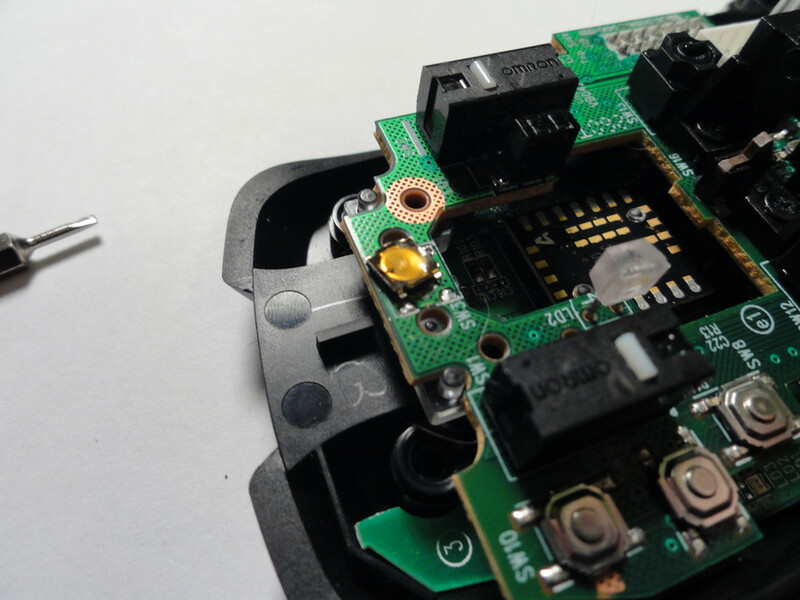 There is no marking of who manufacturers it, but comparing the underside of the switch to the Panasonic datasheet I can confidently say it’s a Panasonic. Using a digital scale and pressing the button down the black top it clicks around ~55 grams force while the grey top is around ~75 gram-force. For comparison the stock left and right click Omron D2FC-F-7N rated 0.7 Newton ~= 70 gram-force also clicked around ~55 gram-force on the digital scale. So the left tilt button does in fact require a bit more force to actuate to prevent accidental tilts. And that force is probably around 1 Newton. 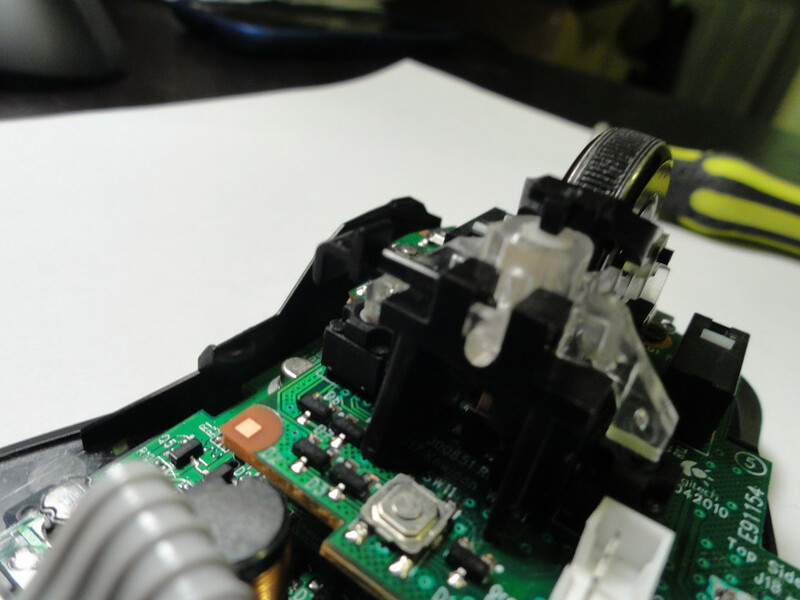 Omron doesn’t have a switch with a higher actuating force and I could not find anything from Kailh besides some unknown China generics. Panasonic does have the EVQ-P0D07K which requires 1.3 Newton ~= 130 gram-force to actuate which might be too much. As of this comment I have not tried out the 1.3N switch. For middle tilts don’t use the Omron part listed. After three weeks I swapped out for Panasonic parts. No more accidentally tiling left or right when doing a middle click. Thanks a lot for this writeup. 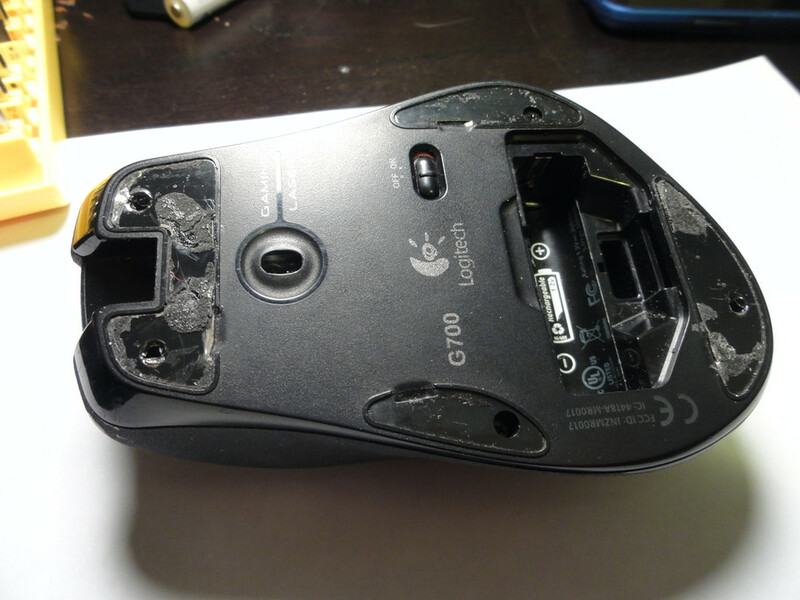 This has inspired me to fix my old G700, even though I have already replaced it with a G700s! to HybridSix, Blackthorn, and short_lurker!!! Very helpful. Would be so nice if Logitech would just still sell this mouse. Clearly a demand if people are tracking down and replacing switches. Anyone else ever have an issue with the switch between fly-wheel and ratcheting scroll? I have two G700s’s, and just took the wheel from one and put it in the other. Ebay sells Chinese knock-off replacements. I’ve ordered one of these in case my second wheel fails.